This fertile impoundment contains some impressive fishery resources, particularly in the form of largemouth bass and yellow perch, and it has developed a well-deserved reputation for producing large northern pike. (There is a strong possibility that pike have reproduced here.) The bass are of average to large size and fish over four pounds are not uncommon. The yellow perch are not particularly large, but they are very abundant. The northern pike are relatively rare, but exceptionally large individuals are reported caught on a fairly regular basis. Ice fishing during the winter, jigging for perch and setting tip-ups for pickerel and bass are popular. Anglers who can get a canoe onto the middle basin (use the causeway between the middle and north basins) and fish with weed-less lures during the summer should enjoy some excellent bass fishing. 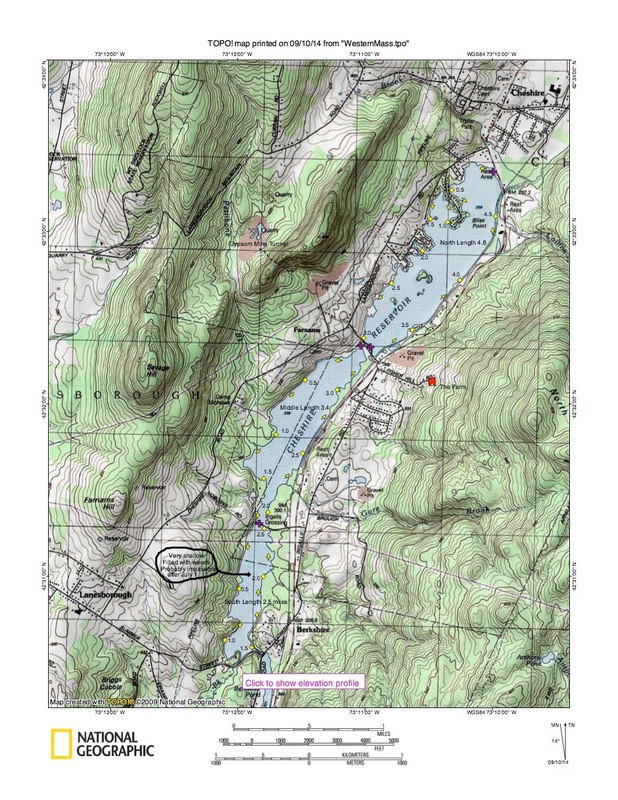 This reservoir is located on the western side of Route 8, is also known as Hoosac Reservoir or Hoosac Lake. It is divided into three basins by a pair of causeways. The south basin is extremely shallow, the middle basin has a maximum depth of about six feet, and the north basin has a maximum depth of nine feet. Submerged aquatic vegetation is extremely abundant in all three basins, choking up the surface area for much of the summer. The shorelines of the south and middle basins are undeveloped, but the western shore of the north basin is heavily developed with summer cottages and permanent homes. Access for boat fishermen is a formal paved ramp located on the north end of the north basin just off Route 8. The other two basins can be accessed with car top boats or canoes launched from the causeways. (Given the weed situation, we recommend a canoe or kayak.) Shore fishing access is good thanks to the causeways and a railroad bed running along the eastern shore. Access the south and middle basin off a privately owned, though publicly available, ramp off Farnam’s Road. Access to the south basin is off the causeway on Nobody’s Road. Only kayaks and canoes can be launched here. From US Route 90 (Massachusetts Turnpike) take exit 2. At the end of the ramp turn right on to Housatonic Street. You are on Route 20 West. Follow Route 20 through town and toward Lenox and Pittsfield. Route 20 and 7 will merge and continue north. When Route 20 turns left (west) in Pittsfield, continue straight (north) on Route 7. When Route 9 turns right on Dalton Avenue, continue straight on Route 8 North. You should see Cheshire Reservoir on your left at mile 17.0. South Basin - At mile 18.3 turn left on Nobody’s Road for Put-In, otherwise continue north. Middle Basin - At mile 19.6 turn left on Farnam’s Road. The Launch is on you left less than a tenth of a mile. Otherwise continue north on Route 8. This section of Cheshire Reservoir is clearly the favorite for fishers and power boaters. At the North end on Route 8 is a large paved state boat ramp with plenty of parking. An alternate launch is Farnam’s Road for car top boats only. For this description, I will assume a north end launch. After launching, begin by turning west. The north end is characterized by wetlands with tall grass and shallow water. As you turn south along the western shore, homes with beaches and docks are everywhere. Follow the shore around Bliss Point. Enter a cove at mile 1.9 and follow north into the cove along Lake Shore Drive. Turn south in the cove and pass by a tiny island at mile 1.5. Follow the shore southward and enter Shadowland Cove at mile 2.0 next. Much smaller than the last cove, it is lined with docks and homes. Next enter Willow Cove paddling the west shore. Now head offshore to the largest island in the reservoir. It is actually two islands connected by a causeway. All the islands, as well as the reservoir, are state owned and controlled by the DCR. This is an excellent place for a paddle break or even a picnic. There are trails and numerous areas for landing. Find a spot that looks good and start your short hike. There are several other smaller islands but none of them are as much fun to visit. Now head west to the shore and then south where home structures give way to forest and wetlands. The shore is quite shallow in some areas with a sandbar that leads out from land. 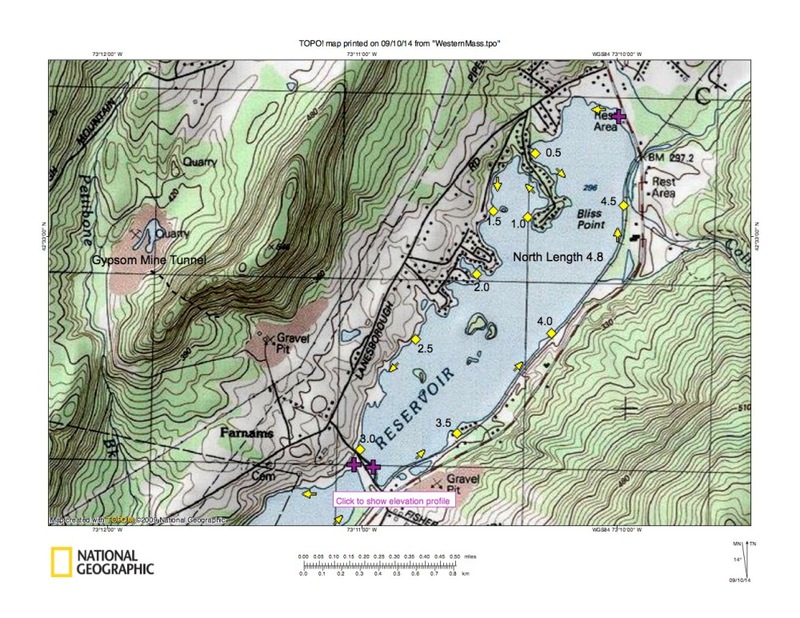 At about mile 3.0 you approach the south end of the north basin. It is all public land along Farnam’s Road and it is very park like. If you need to relieve yourself at the restrooms or just need to stretch your legs, this is a good place to do it. In the summertime many people enjoy a stop here along the Ashuwillticook Trail. Fisherman and picnickers along the shore are quite common. Here is where you can carry your boat to the Middle Basin if desired. This is section is shallow, under 2 feet in most sections, and under 6 inches in some sections. Most of this area is impassible because of weeds most of the year. 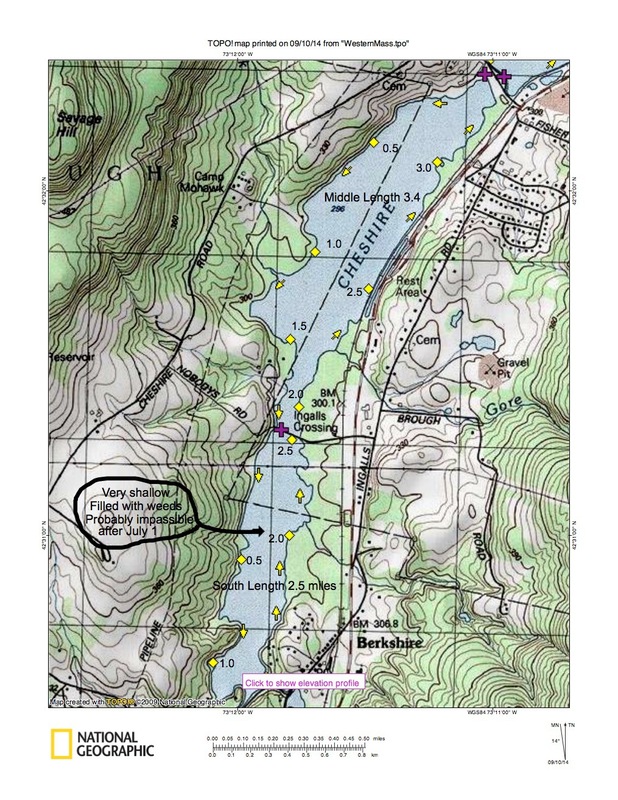 Scout this area early in April before paddling so that you can plan. Expect to see large carp that will surprise you when they suddenly move stirring up the water with their dorsal fin above the surface. Your best opportunity to accessing the most water can be accomplished with a kayak rather than a canoe since it draws less water. The Lake’s carbonate rich bedrock gives the waters a high acid buffering capacity. This relatively high alkalinity ensures that the Lake’s pH remains close to neutral (pH 7.2-7.65), which is nearly ideal for Eurasian milfoil. Freeing the Lake of it has been a constant battle since milfoil outcompeted another aquatic weed that had infested the Lake since the 1960’s. Though the diquat herbicide that was applied in the summer of 2000 has completely cleared the weed from the North Basin, milfoil still chokes the two upstream basins and will continue to be a threat to the entire Lake for the foreseeable future. Years of milfoil infestation and sporadic herbicide applications have reduced the biodiversity in the Lake considerably. During the late summer, “when the Lake is completely glutted and its current stilled,” by milfoil, there are occasional algal blooms in the protected coves around the Lake (Lake District Management Plan, 21). Launch your boat at a privately owned, but publically available, boat launch. At the north end of this basin is the remains of a processing plant. This factory was used to process gypsum and contains the remains of furnaces. To the northwest a quarry about ¾ of a mile away delivered ore via railroad that traveled a tunnel a quarter of a mile long and down to the lake. The shoreline continues with uninterrupted woods until, just under one mile, you will come upon a small beach. This is Camp Mohawk established in 1946 and has been owned by the Schulman family. First founded as a sleep-away camp, today Camp Mohawk offers a robust day program for ages 6 to 14with an optional Thursday night sleepover. Continue south with almost no view of any structures. At 1.9 miles you will come to the causeway of Nobody’s Road. There is a small culvert for water to pass but you must carry over to get to the South Basin. See below for South Basin. Now travel north along the east side of the Middle Basin. The paddle is unremarkable. Views of the Ashuwillticook Rail Trail are possible along most of the 1.5 mile paddle north back to the boat launch.